Investors reacted harshly to the rental-car giant's first-quarter report last month. 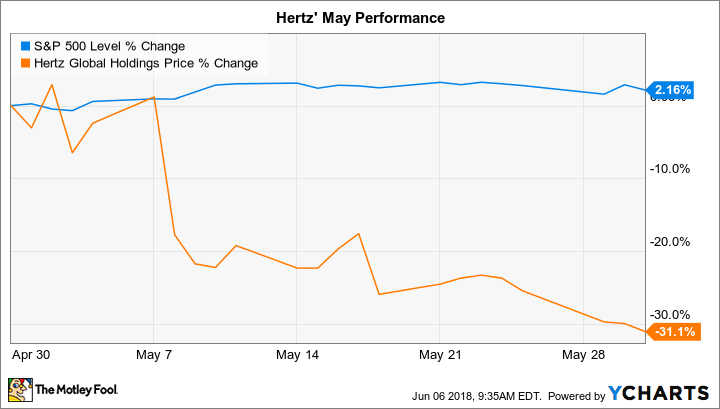 Hertz Global Holdings (NYSE:HTZ) shed 31% last month compared to a 2% increase in the S&P 500, according to data provided by S&P Global Market Intelligence. The slump added to significant losses for long-term shareholders as the stock is down by over 70% in the last five years. Investors reacted harshly to the rental-car giant's first-quarter earnings report. While Hertz showed modest sales gains, its losses were wider than expected. Depreciation, vehicle operating costs, and interest expenses all combined to keep overall expenses at 111% of sales. That marked just a modest improvement over the prior year's 115%. On the bright side, Hertz managed to boost key usage metrics like vehicle utilization rates and revenue per vehicle. CEO Kathryn Marinello and her executive team believe elevated spending in 2018 should produce a second consecutive year of falling profits as the company adjusts to the surge of demand for ride-sharing services. But beginning in 2019, management says, earnings should return to positive territory. However, given the intense pressure on the rental industry, investors likely won't reward Hertz stock with big gains until they see concrete evidence of an imminent profit rebound.